Vegan desserts, Valentine’s Day—is there a faster or more valuable way to your lover’s heart? I guess it depends on who you ask. But if you’re looking to impress your vegan—or even meat-eating—Valentine with some fancy vegan desserts, you could be in for the night of your life. Not a master baker? No problem! There are also some easy vegan desserts you could put together if you just bounce out of work a little early to beat your lover home! They’re worth it, are they not? 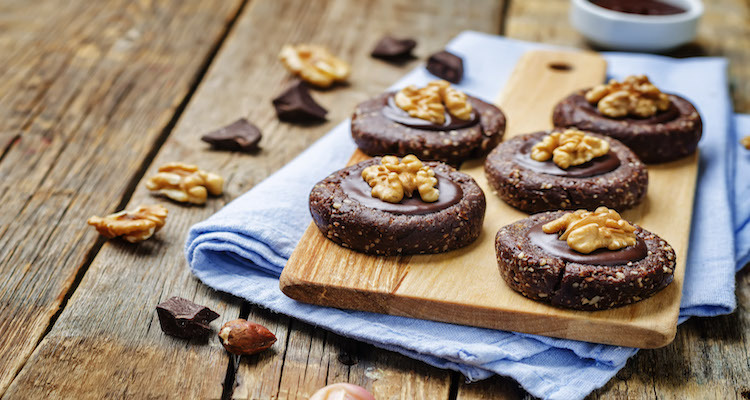 Boost the love in your life with some of these simple and tasty vegan desserts. Lightly grease a standard 12-cup muffin pan. Make sure beans are drained and rinsed. For flax egg: Combine the water and flaxseed meal in the bowl of a food processor. Pulse a few times and allow to rest for three to five minutes. Add remaining ingredients to food processor (besides the optional toppings) and puree until smooth, about three minutes. Scrape down sides as required. If the batter appears thick, add one or two tablespoons of water and pulse again. You do not want the batter runny. The consistency should be about that of chocolate frosting, but slightly less thick. Evenly distribute batter into slots on muffin pan. Smooth the tops. Sprinkle with toppings (if you want). Bake until tops are dry and the edges start to pull away from sides, about 20 to 25 minutes. Soak pitted Medjool dates in water for 10 minutes. Drain water from dates and transfer to a food processor. Add the other ingredients. Process until the nuts are crumbled. The crust should stick together on its own. Cut four-inch strips of parchment paper and place in the bottoms of each compartment in a mini-muffin tray. Press about one and a half teaspoons of the mixture into the bottom of each mini muffin cup. Add pre-soaked and drained cashews to a high-speed blender along with the rest of the ingredients. Blend until smooth. Pour the mixture into a bowl and set aside. Empty and clean blender to make strawberry purée. Allow frozen strawberries to thaw and become soft at room temperature, or heat over low heat in a saucepan for a few minutes. Remove when soft and put in blender. Blend until they are a smooth purée. Take about a tablespoon of the cashew filling and pour on top of the pressed crust. Then take a one-half teaspoon of the strawberry purée and add a dollop onto the cashew filling. Use a toothpick to swirl the two mixtures around. Freeze for one to two hours until solid. Remove from mini muffin trays and let thaw for 10 to 15 minutes before serving. Grind almonds into a fine meal in a food processor. Transfer to a mixing bowl. Grind oats to the same consistency, then add the almonds back to the processor. Add sea salt and cinnamon. Run the food processor and add a few dates at a time until the mixture starts to blend. Press three-fourths of the mixture into a 9” x 13” pan lined with parchment paper. Place the peanut butter, bananas, and sea salt in a food processor. Blend well. Using the same method as with the almonds-oats mixture, feed in a few dates at a time until the mixture is smooth. If it seems too thick, spread with a spatula and add a bit of water. Spread the mixture over the pressed base in the pan. Spread jam on top of the peanut butter later (mix in chia seeds beforehand if you like). Add the rest of the crumble on top. Chill in the refrigerator overnight and cut into squares. If using frozen raspberries or strawberries, bring to room temperature until soft. Heat if needed. Soak pitted dates in water for 30 minutes, or until they’re extra soft. Add the sauce ingredients to a blender and blend on high until smooth. Adjust to taste, if desired. Keep refrigerated until ready to use. You can heat before serving if desired. Prepare all your Valentine’s favorite toppings (in advance). Place the sliced banana in a bowl. Add two scoops of the vegan ice cream and top with some vegan coconut whipped cream. Add the rest of the desired toppings and dig in! Blend chocolate ingredients in a small bowl and set over a small pot of boiling water. Stir until the mixture is melted and smooth. Put one tablespoon of the chocolate in the base of 10 silicone or paper baking cups. Place in the freezer for 10 to 15 minutes, or until set. In the bowl of a mini food processor, place raspberries, shredded coconut, maple syrup, dairy-free milk, coconut oil, and a large pinch of sea salt. Blend on pulse setting until combined. Remove muffin cups from freezer. Take one teaspoon of raspberry mixture and gently press into the center of each chocolate cup. Place a halved raspberry on top. Return the molds to the freezer for five minutes. Reheat any remaining chocolate that has started to solidify. Pour one tablespoon of chocolate over the top of each raspberry mound to totally cover, then return to freezer. Allow 20 minutes to set, then eat straight from the freezer. Any good foodie will tell you that the way to a person’s heart is through their stomach. So why not win your lover’s heart with some delicious but easy vegan desserts this Valentine’s Day? You’ll thank us later! Dana, “Vegan Gluten-Free Black Bean Brownies,” Minimalist Baker, 2013; https://minimalistbaker.com/vegan-gluten-free-black-bean-brownies/, last accessed February 4, 2019. Toyota, L. & Diemer, J., “Irresistible Vegan Strawberry Cheesecake Bites,” Food Network, February 10, 2018; https://www.foodnetwork.ca/valentines-day/blog/irresistible-vegan-strawberry-cheesecake-bites/33882/, last accessed February 4, 2019. Toyota, L. & Diemer, J., “Healthy Peanut Butter and Jam Squares” Food Network, September 29, 2015; https://www.foodnetwork.ca/healthy-eating/blog/healthy-peanut-butter-jam-squares-34103/, last accessed February 4, 2019. Angela, “The Big Vegan Banana Split,” Oh She Glows, March 28, 2014; https://ohsheglows.com/2014/03/28/the-big-vegan-banana-split/, last accessed February, 2019. Galloway, E., “Raspberry-Coconut Dark Chocolate Cups,” Food and Wine, April 2014; https://www.foodandwine.com/recipes/raspberry-coconut-dark-chocolate-cups, last accessed February 4, 2019.